studying in Melbourne. View VU Sydney course information. Achieve your dream of becoming an in-demand IT professional. Our diploma offers a practical, supportive program directly leading into the second year of Bachelor of Information Technology. Our Diploma of Information Technology has been designed for students taking the first step towards our bachelor degree, and professionals building their current IT knowledge and skills. We help you prepare for a degree with targeted support and tuition. Over an extended 15-week semester, we’ll work with you to enhance your professional-communication and academic-writing skills. Our lecturers include staff who are world leaders in the IT field. We conduct our own high-quality research, which keeps our courses relevant, world-class and aligned to industry. Our experienced lecturers, excellent research facilities, and connections to industry give you first-rate opportunities and support. The digital world is constantly changing. Our course is regularly reviewed to ensure current practice and IT industry developments are included. Our Women in Science Engineering program supports our current university students, and inspires women to choose engineering and science careers. We run hands-on workshops in science, technology, engineering and mathematics (STEM) disciplines for secondary-school students. The average salary for an ICT support technician is A$65,700 (JobOutlook). If you continue onto our Bachelor of Information Technology, you’ll be ready to work in higher-level IT roles, earning a higher salary. International student Shuyan Hu entered the second year of the Bachelor of Information Technology at VU after completing the Diploma of Information Technology at VU College. 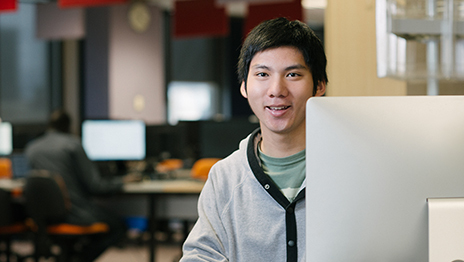 When you progress to the Bachelor of Information Technology, you’ll be eligible for professional accreditation with the Australian Computer Society (ACS). To qualify for the award of Diploma of Information Technology, a total of 96 credit points must be completed. 1. Apply a broad body of fundamental knowledge of information technologies in selected areas of study from the areas of: networking, ICT management, web application development, operating systems and database. 2. Use the latest information technologies, and with self- learning capabilities, solve real-world ICT related problems. 3. Exhibit a range interpersonal and academic skills with a strong focus on development practice in an independent or collaborative environment. 4. Present foundation technical and theoretical knowledge and skills for industry certifications from reputable international vendors CISCO Certified Network Associate (CCNA) and Linux Professional Institute Certification (LPIC-1). Completion of an Australian Senior Secondary Certificate (VCE or equivalent).